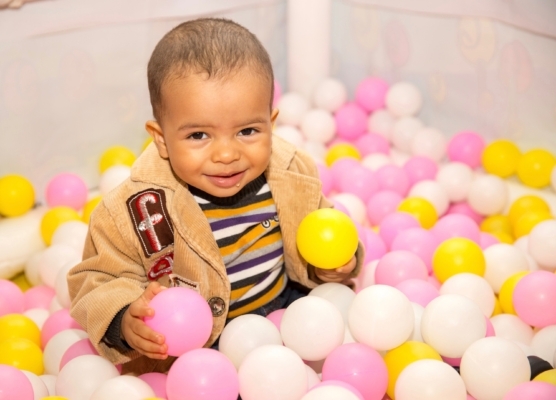 Our infant room is a warm and cozy setting for our youngest children to grow and develop. We have capacity for ten infants and have three wonderful teachers to care for them. The age range in the infant room is six weeks to 18 months. On staff we have two Registered ECE Teachers and one Assistant Teacher. Our goal in the infant room is to follow each child’s individual schedule. We use individual daily charts to record all aspects of the child’s day and we encourage open communication between staff and parents. Our staff complete monthly Individual Program Plans for each child to set personal goal. This enables staff to help children enhance their existing skills and ensure that they are reaching their milestones. We provide daily activities and creative crafts. Yes, infants can do artwork! We use non-toxic supplies that are age appropriate in size. We have an “Art Gallery” on the wall to proudly display our budding Picassos’ work. The infants play outdoors every day, weather permitting, in our large playground. We have triple strollers that allow us to go for walks on days where the playground may be too wet. The centre provides all of the meals and snacks for the children. Our catering company can accommodate special diets. Upon enrolling at the centre, the parents complete a checklist of foods their child has already been exposed to. It is recommended that parents introduce new foods at home several times first to reduce the chance of an allergic reaction. The centre supplies milk and juice; formula is provided in a ready made container by the parents. The parents also supply diapers and wipes. Each child has a cubby and crib in our quiet and soothing sleep room. This is an exciting age with constant changes in the child’s development. We provide a stimulating environment to allow each individual to develop into a curious and independent toddler.